In relation to Iraq, the plan to split the country into three parts has been publicly advocated by US officials ad nauseam. 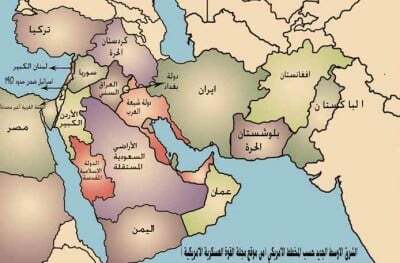 The President Emeritus of the CFR, Leslie Gelb, argued in a 2003 article for the NY Times that the most feasible outcome in Iraq would be a “three-state solution: Kurds in the north, Sunnis in the center and Shiites in the south.” In 2006, a potential map of a future Middle East was released by Lieutenant-Colonel Ralph Peters which depicted Iraq divided into three regions: a Sunni Iraq to the West, an Arab Shia State in the East and a Free Kurdistan in the North. The current US Vice President, Joe Biden, also penned an article which was co-authored by Gelb titled: United Through Autonomy in Iraq. The 2006 article argues for a decentralized Iraqi state where power is held by three “ethno-religious” groups: “Kurd, Sunni Arab and Shiite Arab.” Furthermore, the NY Times published an article in 2013 titled: Imagining a Remapped Middle East; How 5 Countries Could Become 14, which envisages the Middle East and Libya completely Balkanized. The Western elite’s strategy is to create a Middle East (and a world for that matter) devoid of strong, sovereign, independent nation-states that can resist imperial advances. Fracturing countries into feuding micro-states ensures Western interests are not confronted with a cohesive entity which can collectively unite to oppose this belligerent force. “Divide and conquer” as Mendelsohn’s article is titled, the ancient strategy used by an array of imperial powers, from the Roman’s to the British, remains the strategy of the Western Empire today.